The Global Volcanism Program has no activity reports for Isla el Tigre. The Global Volcanism Program has no Weekly Reports available for Isla el Tigre. The Global Volcanism Program has no Bulletin Reports available for Isla el Tigre. Isla El Tigre is a small, 5-km-wide island located across a narrow 2-km-wide strait S of Isla Zacate Grande in the Gulf of Fonseca. The conical, basaltic stratovolcano is the southernmost volcano of Honduras. It is less dissected than neighboring Zacate Grande on the mainland to the N, and is of probable Holocene age (Carr 1992, pers. comm.). A single satellitic cone, El Vigía, overlooks the village of Amapala on the NW flank. Carr M J, 1992. (pers. comm.). The Global Volcanism Program is not aware of any Holocene eruptions from Isla el Tigre. If this volcano has had large eruptions (VEI >= 4) prior to 10,000 years ago, information might be found on the Isla el Tigre page in the LaMEVE (Large Magnitude Explosive Volcanic Eruptions) database, a part of the Volcano Global Risk Identification and Analysis Project (VOGRIPA). There is no Deformation History data available for Isla el Tigre. There is no Emissions History data available for Isla el Tigre. The morphologically youthful Isla el Tigre is a small, 5-km-wide island located south of Isla Zacate Grande in the Gulf of Fonseca. 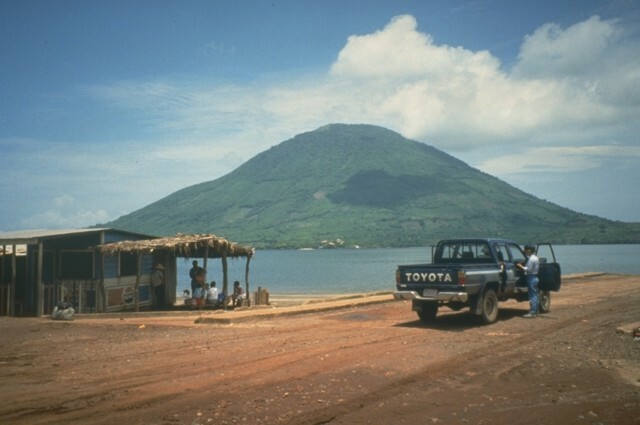 The conical 783-m-high basaltic stratovolcano, viewed here from the NE across a narrow 2-km-wide strait from Zacate Grande, is the southernmost volcano of Honduras. Photo by Mike Carr, 1991 (Rutgers University). Isla el Tigre is a small, 5-km-wide island across a narrow strait south of Isla Zacate Grande in the Gulf of Fonseca of Honduras. The conical, 783-m-high stratovolcano, seen here from the NE on Zacate Grande island, is less dissected than Zacate Grande volcano and is of probable Holocene age. A single satellitic cone (far right) overlooks the NW-flank town of Amapala, Honduras' only Pacific port. The peak in the distance beyond the right-hand flank is the volcanic island of Meangura. Isla el Tigre in Honduras is seen here across the Gulf of Fonseca from Punta el Chiquirín on the eastern tip of El Salvador. 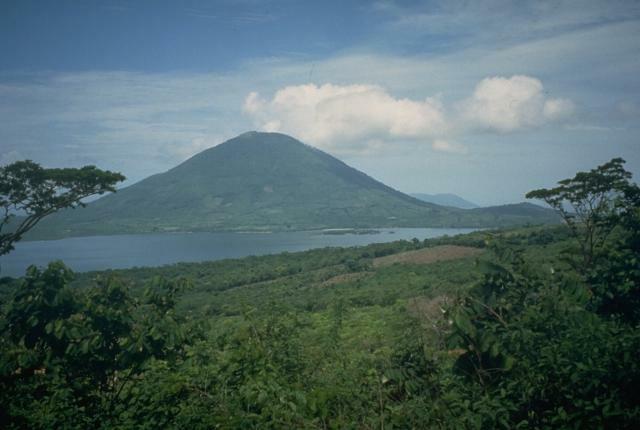 The morphologically youthful volcano rises 783 m above the gulf and is the southernmost in Honduras. A valley on the SW flank (right) extends to the sea and disrupts the symmetry of the volcano. Young volcanoes dot the surface and anchor the shores of the Gulf of Fonseca, which forms the coastline of three countries. 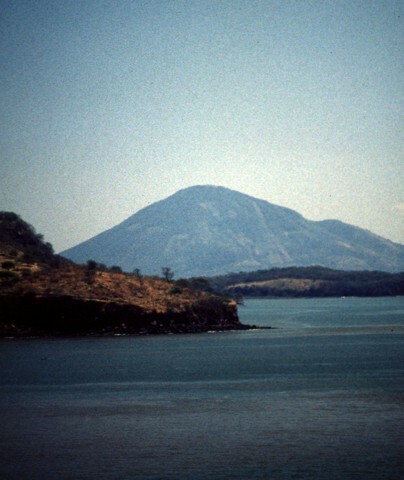 Conchagua volcano occupies the wedge-shaped peninsula (left-center) in eastern El Salvador, while Cosigüina volcano forms the prominent peninsula across the bay in Nicaragua. Clockwise from the top are the islands of Zacate Grande and El Tigre in Honduras and Meanguera and Conchaguita in El Salvador. 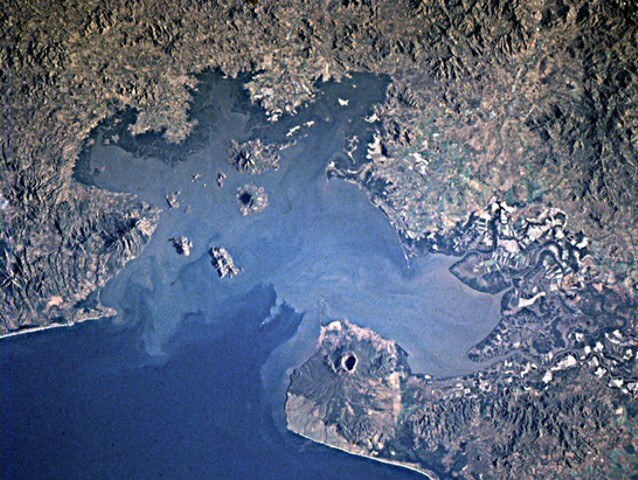 The mouth of the Gulf of Fonseca is about 30 km wide. NASA Space Shuttle image STS82-731-83, 1997 (http://eol.jsc.nasa.gov/). There are no samples for Isla el Tigre in the Smithsonian's NMNH Department of Mineral Sciences Rock and Ore collection. Large Eruptions of Isla el Tigre Information about large Quaternary eruptions (VEI >= 4) is cataloged in the Large Magnitude Explosive Volcanic Eruptions (LaMEVE) database of the Volcano Global Risk Identification and Analysis Project (VOGRIPA).